Check for tampering. 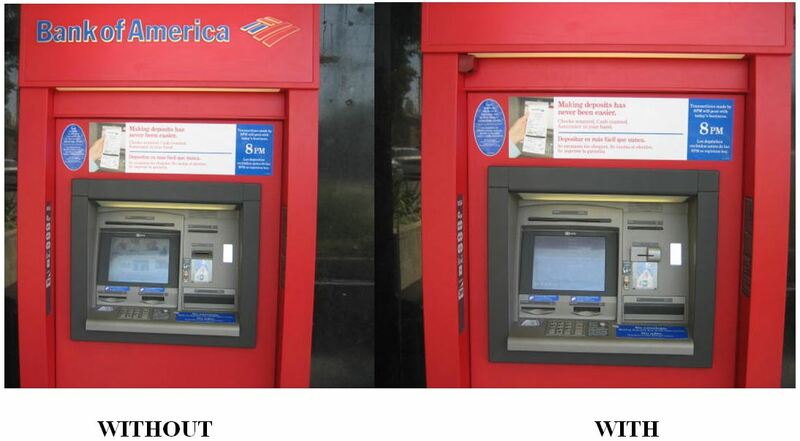 Compare the ATMs next to each other and make sure all the colors and material look correct. If something doesn’t feel right, like the keyboard or card slot, don’t use it. Wiggle everything. ATMs are constructed to be solid and sound. If you see something protruding or fit loosely, feel free to poke, prod, and wiggle it to make sure that it is real. A minor jiggling won’t affect a real ATM, but it just might reveal suspect equipment and thwart a thief’s attempt to get your information. Be careful! Be sure to cover your pin with your hand while you’re typing it in. If they can’t record your pin number then they can’t use your card information – although some skimmers are sophisticated enough to capture pin info, too! Be vigilant on weekends, because it’s harder to report strange activity during the weekend than it would be during the week. This type of crime happens far more often than you’d think, and it can happen to you. If you see something that doesn’t look right – such as strange colored components or hardware that isn’t shaped correctly – you’re better off finding another ATM. You should also report what you’re seeing right away better safe than sorry, and you just might protect a fellow consumer. In general, ATMs located in the public eye are much harder to tamper with, so be mindful of which ATMs you choose. If your options are the ATM inside a busy supermarket or the ATM outside on the sidewalk with relatively little traffic, you may want to consider going inside.